In 2008, critically acclaimed singer/songwriter Andrew Peterson revealed his gifts as a novelist with On the Edge of the Dark Sea of Darkness, a rollicking rip-snorter of a high fantasy yarn. It was imaginative and elegantly-rendered, self-assured and endlessly entertaining, while filled with the same sort of wide-eyed wonder that has permeated Peterson's songs.Darkness introduced the world to the Igiby clan, 12-year-old Janner and his younger brother Kalmar and sister Leeli, along with mother Nia, grandfather (and peg-legged former pirate) Podo Helmer, and a host of other endearing characters populating the land of Aerwiar. As 2010’s North! Or Be Eaten closed, the Wingfeathers (the Igiby family had discovered its royal heritage at the end of Darkness) were sailing east on the Dark Sea of Darkness after a climactic battle with the Fangs of Dang in the ice kingdom of Kimera. The family was reuinted after spending much of the book apart, and, most notably, Kalmar—the King of Anniera—had been transformed into a Gray Fang and now looked like a wolf. Monster finds the Wingfeathers arriving at the Green Hollows, a hospitable land at the eastern end of the aforementioned Dark Sea. Almost immediately, Peterson flips the script on the previous two installments by making stablility, not flight, one of the norms for the Wingfeathers. Soon after arriving in the Hollows, the Wingfeather clan settles into a comfortable home on Chimney Hill. Janner, Kalmar, and Leeli are all enrolled in the local school, and routine becomes the norm. Obviously, it isn’t the norm for long, and soon Kalmar’s Gray Fang visage begins to pose problems and the plot proverbially thickens. By the time Monster winds to a conclusion, one massive plot surprise is revealed, and the Wingfeathers are again on the move, this time headed to what one assumes will be a showdown with Gnag and the dreaded Fangs of Dang in the saga’s conclusion, The Warden and the Wolf King. 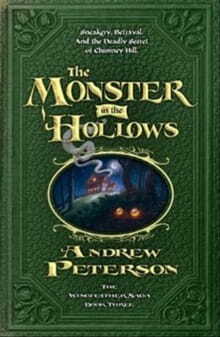 Peterson’s Hollows is a different sort of story than the previous two, less about narrow escapes or imaginative beasties, and more about identity and internal conflict. If Darkness or North! were about the joys of discovering the extraordinary out there in the world, Monster is about coming to terms with the creatures lurking underneath your own skin. It’s more emotionally rewarding than Wingfeather’s first two, if less thrilling. These Wingfeather kids have a way of growing on you. Also of note is the fact that the series has changed in tone. Through much of Darkness, and even North! to a certain extent, Peterson’s screwball sense of humor was on full display, through names like Brimney Stupe, creatures like the Toothy Cows of Skree, and irreverant footnotes involving boogers. In Monster, the humor isn’t gone, but Peterson has wisely brought forward weightier issues. Just as J.K. Rowling did so brilliantly with Harry Potter, Peterson has recognized his audience’s maturation, and matured the themes accordingly. A passage at the end with an unexpected goodbye is remarkably moving and full of genuine emotion. As Monster closes, an expository-rich chapter delves deeper into the mythology of Aerwiar, and one finally gets the sense of the breadth of Peterson’s vision. Readers who entered the Wingfeather Saga enjoying a light-hearted, brilliantly imaginative romp are now exiting Hollows gripped by the powerful truths Peterson has woven metaphorically into the very fabric of his world. This is a fantasy series to be read and re-read.